Social liberalism is the ideology of collective liberties and rights that favors social welfare and justice. It comes in a political and economic form. It is one of two dominate types of liberalism (the other being its predecessor classical liberalism). Like classical liberalism, social liberalism is a left-wing ideology of liberty and equality. Unlike the classically left-wing classical liberalism, which favors liberty on issues of state, social liberalism mixes in classically conservative planks like taxation, regulations on individuals, groups, and businesses, and more in an effort to ensure social justice and social welfare via government. Social liberalism is considered a socially left wing ideology (despite its mixed nature). It generally comes in populist and elitist forms that can differ in their positions on how government should be used to ensure social justice. At an extreme, social liberalism can, given the above, become puritanical and authoritative with its use of collective power (as we can see in prohibition for example.) Its focus on social progress puts in direct odds with its antithesis social conservatism on most, but not all, issues (after-all social conservatism also has a mixed nature as well, and can itself become puritanical and authoritative). TIP: In America when we say “liberal” we mean social liberal. In other countries “liberal” means classical liberal (for example in the U.K. the Labour party is like the U.S. Democrats and is called a “social liberal” party while the liberal Democrats of the U.K. are classical liberals). The fundamentals of the terms never change, but their meaning differs in common language by nation. If one says American liberalism, they are talking about social liberalism like the U.K. Labour party (er, um, mashed-up with neoliberalism… like the Labour party). In the political from, social liberalism is the ideology of liberty, rights, and egalitarianism with a focus on collective equally (over individual liberty). In this sense it is an evolution of classical liberalism focused on social equality (it generally still retains its classical liberal views, but not at the expense of social equality). Generally, it rejects the the laissez faire style of classical liberalism and seeks progressive policies that can offset the hardships felt by those left behind under pure-capitalist and the old conservative economic systems. Thus, we can say social liberalism is an ideology where equality and collectivism come before liberty and authority (despite liberty being an important aspect of social liberalism and despite the necessary use of authority to ensure collective liberties and rights). It is exemplified by the progressive movements of the late 1800s and early 1900s that called for “progressing toward social equality,” figures like FDR, and a push for a Second Bill of Rights focused on economic rights (what I call “second rights“). Social liberalism favors social justice and the common welfare over the authority of individuals, even if it means the use of collective authority. It is in direct opposition to social conservatism, as that ideology generally calls for social hierarchy and traditionalism and pushes back against social liberal social reform. In the economic form, social liberal economics is the ideology of “trickle up economics” found in works ranging from Marx, to Mill, to Keynes. It generally rejects both classical liberal economics and the economics of monopolies (both state backed and private). It seeks to use taxation, regulation, trust busting, and other progressive technologies to ensure a fair economy for all and to stave off economic inequality (even at the expense of using state power). TIP: Social liberalism is the ideology of trickle up. It believes in social equality and social justice, but it is not socialism. If it was socialism, it wouldn’t have the world liberalism in the title (and in fact, the whole concept is that it rejects pure socialism and pure liberalism and instead is a mash-up). A social liberal is a progressive liberal. Bernie Sanders and Jeremy Corbyn are social liberals, and so are the Clintons and Obamas (Sanders and Corbyn more progressive and toward the social, one wing more “neoliberal” and classically liberal and toward the liberal; all are looking for mixed-market solutions to social injustice that embrace planks of classical liberalism). The video below shows how this left-wing evolution of liberalism is different than the classical form. Classical Liberalism vs. American Liberalism (Drive Home History #3). Import Figures of Social Liberalism: Rousseau, Gouverneur Morris, the Reform era thinkers, Marx, William Jennings Bryan, the Progressive era thinkers, Barack Obama, and Bernie Sanders. TIP: Social liberals generally support a social democracy and the welfare state to some extent. That means taxation and social spending… but from a liberal view with a goal of lifting all ships. Welfare State and Social Democracy. FACT: A father of Social Liberalism, Leonard Trelawny Hobhouse, wrote describes the elements of [social] liberalism in his masterwork Liberalism. He denotes them as: 1. Civil Liberty. 2. Fiscal Liberty. 3. Personal Liberty. 4. Social Liberty. 5. Economic Liberty. 6. Domestic Liberty. 7. Local, Racial, and National Liberty. 8. International Liberty. 9. Political Liberty and Popular Sovereignty. To give you an idea of Hobhouse’s importance, he coined the term social liberalism in an effort to reform “classical” liberalism and reject socialism. The roots of social liberalism: Classical liberalism (from which social liberalism comes) is an idea that is closely related with classical democracy (which Plato essentially defined as an ideology of liberty and equality in his Republic). Cicero comments on what would become known as liberal values and so does Machiavelli. However, the proper roots of liberalism are found in the Age of Enlightenment when the use of reason and the printing press allowed the liberal revolutionaries to break away from Kings with the aide of philosophers like Locke and Rousseau. In other words, the roots of social liberalism are the roots of classical liberalism. The Evolution of Social Liberalism: Social liberalism starts in proper after the liberal revolutions (and a little before) with those who expressed dissatisfaction with the focus on liberty (which was allowing for things like extreme economic inequality and slavery). The first real “progressives” in America were the Reformers, but social liberalism starts in earnest with Marx (where liberals who didn’t want to go full-tilt socialism instead shifted to factions like “New Whigs” and later “Labour” in England for example). The roots of social liberalism are so intwined with classical liberalism it can be hard to discuss any specific starting point. But in simple terms, social liberalism is a rejection of pure classical liberalism mashed up with Marx (but more in the style of Keynes). Later, neoliberalism tried to mash up Keynes and Smith and offer a third way, although the more progressive social liberals tend to reject that style, it is favored by the social liberal majority parties. TIP: The term liberal didn’t come into popular use until later, we call the liberals of the era of the liberal revolutions “classical liberals” today to denote a stance different from the modern form of liberalism “social liberalism” (which errs towards equality). In other words, liberalism forked into two clear paths in the 1800s, the original one we call “classical” the one focused on social equality we call “social.” They are both liberalism, and they both have the same core values of liberty, equality, tolerance, and the use of reason. They just differ on their position on the use of governmental power to ensure the common welfare. TIP: There were many different forms of classical liberalism in the late 1600 and 1700s, and even more arose over time as socialism and social liberalism also arose in the 1800s. The difference between types of classical liberals is as striking as the differences between, in terms of late 1700’s America, a classically liberal slave holder, a classically liberal abolitionist, and a classically liberal baron from New England. Likewise, if you look to philosophy you’ll see that even the more classically liberal Locke and socially classically liberal Rousseau are strikingly different. Social Liberalism Compared to conservatism and classical liberalism: Classical liberalism and social liberalism are, in many ways, the antithesis of classical conservatism and social conservatism respectively. This chart shows the different types of liberalism and conservatism as the political “left” and “right”. 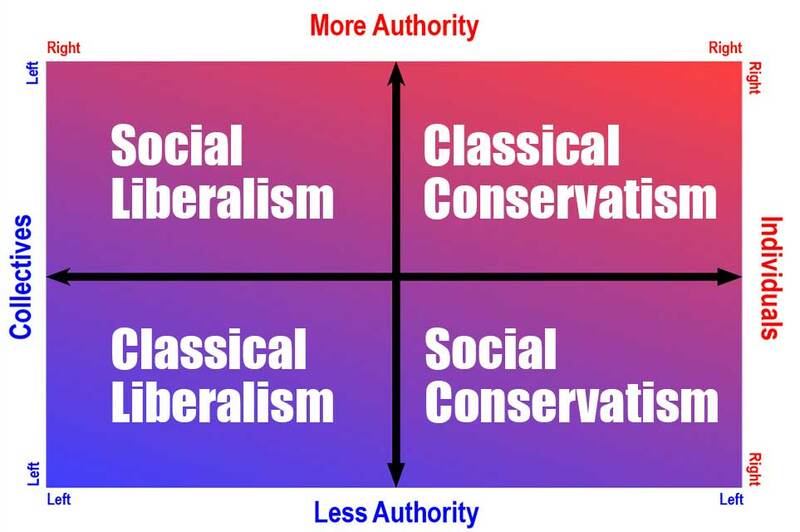 TIP: As you can get a sense of from the above charts, in terms of classical forms of governments: Conservatism is the ideology of Monarchies, and Liberalism is the ideology of Democracies (meanwhile, the ideal mixed-republic‘s ideology is somewhere in the middle despite being favored by classical liberals.) Likewise, in terms of their social forms, social conservatism is the ideology of social hierarchy and nativism and social liberalism is the ideology of egalitarianism and inclusion. A person may be inclined toward any ideology due to their personal tastes, but generally speaking they are all valid and naturally occurring pieces of the same puzzle meant to temper each other. TIP: On our page on social conservatism I point out that at an extreme, fascism is a socially conservative ideology. Well, at an extreme social liberalism can become socialism and dip into communism. Meanwhile liberalism can turn into oligarchy (if no controls are put on the free-market) and classical conservatism is what everyone rebelled against in the first place. Our founders wisely called for a mixed-government for these sorts of reasons. Social progress may sound better than other ideologies on-paper, but each ideology has its pros and cons. Different forms of social liberalism: Finally, let’s look at some different forms of social liberalism to hammer in the point that this ideology is really a single term under which many different forms fall. Ye, Really Old Social Liberals: Plato was essentially a social liberal. He didn’t call for pure liberty and equality, he called for a planned state to ensure the maximum amount of liberty and equality. This somewhat classically conservative centrally planned state in which enlightenment was the highest good and each class was ensured happiness is probably a bit more like social liberalism than people generally give it credit for being. Old Radical Social Liberals: The Jacobin revolution, unlike other liberal revolutions, was a little more focused on left-wing populism and equality than just “liberty.” It is an odd modern starting point, but it really did have a Rousseau inspired social liberal faire. Social classical liberalism: Most liberal philosophers were what I would call social classical liberals. The founders of America couldn’t dismiss slavery; Locke and Montesquieu defined it as an abomination. Rousseau advocated for the general will and voting rights. The philosophers, as is evidenced by their famous works, were very focused on republics, mixed governments, human rights, being against slavery, justifying private property, the state of nature, the social contract, the rights of man and citizen, etc. In the 1600’s and 1700’s, they developed ideas that we haven’t fully grasped today. To use an analogy, where the classical liberal radicals were like early versions of Malcolm X, the classical liberal philosophers were like early versions of Martian Luther King. This group included the early progressive groups like abolitionists and reformers. Modern Social liberalism in general: Starting in the mid-1800’s a new wave of liberalism began pushing back against social inequality. The easiest way to see this is over issues like Slavery in America and Marx in worldwide economics. In both cases, classical liberalism had finally given rights to certain classes of white men, who in America, England, and France were well on their way to finally becoming worldwide superpowers. However, the focus on individual liberty had a cost. Where a white person born in the right situation could go on to become a Rockefeller or Carnegie, a black person living in the south was likely to be property; women were either property or nearly property; most of the working class wasn’t far removed from slavery in their working and living conditions. Life was better for some Caucasian bourgeoisie, but still very difficult for what today we call “the 99%” (the proletariat), especially if you were poor, female, or non-Caucasian. 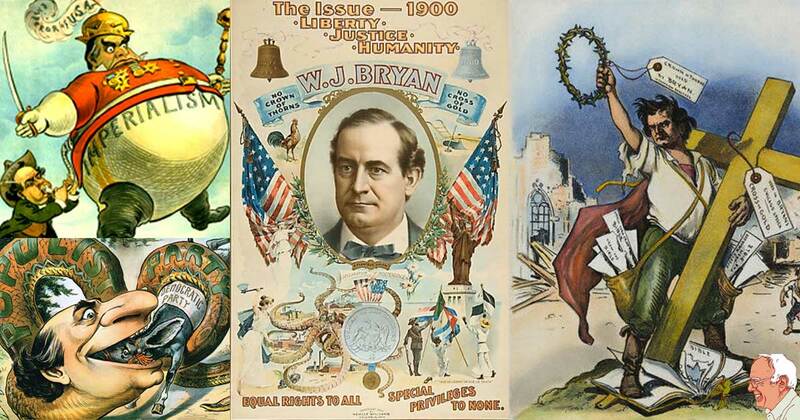 Lincoln, William Jennings Bryan, and some wealthy families like the Roosevelts began to push for social justice. The followers of Marx pushed their country toward socialism. Thus, we get a wide range of types of SOCIAL liberalism. American Social Liberalism: The ideology of Lincoln, William Jennings Bryan, and the Roosevelts that says, you know what Gouverneur Morris was right. He may have been a bit of conservative in his favoring of government, but at least he was willing to stand up against slavery. That isn’t “individual liberty” that is BS. In other words, they are willing to use state power (and thus not be classically liberal) to ensure social justice. When social liberalism is embraced by progressives like Bernie Sanders, we might call it American democratic socialism. Social Capitalism: A term I use to describe those who favor social justice but also favor capitalism over communism (see an essay on re-defining Social Capitalism). I would say almost every modern American liberal is a social capitalist. It is the idea that we can move toward social justice via a mostly free or “fair” market. That individual liberty and collective liberty aren’t mutually exclusive. Neoliberal: A version of social capitalism that is focused on classical liberal economics and government power mashed up with Keynes trickle up (because it is mashed up, and because it is embraced by social liberals on the “center” it is worth noting here). Western Marxist Socialism: The ideology of Marx’s non-militant followers. It is a version of socialism that is socially minded and not radically minded. Communism and pure socialism don’t belong on this page, but any ideology that mashes up socialism with liberalism does… and groups like this are on the fringe of doing that. A left-wing anarchist is another type of group that may share some social liberal values, but isn’t expressly socially liberal. These are just examples of groups that fall under this category. lol, I stopped reading there. The author doesn’t even know the basics of political science yet made a whole article. Classical Liberalism is a center-right ideology. That is not true. You I think should try doing research outside of the red-pill alt-right social media circuit. You seem to be the one confused about the basic meaning of the term “liberalism.” Literally, classical liberalism is the classical left-wing ideology (classical conservatism is the classical right wing ideology). A social conservative who wants deconstruction, or a libertarian with some right wing views, or an American conservative who is sort of liberal in terms of economics is being a classical left-wing liberal and/or holding classical liberal left-wing ideology. In other words, with all due respect, try to listen more and talk less. Feel free to google “left-right spectrum.” Let me know if what comes up fits what I say (and you can even look at the sources that aren’t our site for that one) or if it fits what you say. It will fit what I say, because what I say is correct and grounded in history, philosophy, and general fact. It will not fit what you say, because what you say is at best a honest mistake and at worst revisionist propaganda that could only be true in comparative terms. The UK Liberal Democrats are not classical liberals per se but a coalition of social liberals and social democrats who have adopted aspects of neoliberal economic thinking. The old nineteenth century Liberal Party of Prime Minister William Gladstone could be described as classical liberal. The Edwardian Liberals began to shift tentatively to the left under the governments of Asquith and Lloyd George. The Labour Party under Jeremy Corbyn is a democratic socialist party which has rejected the centrism and neoliberalism of the Blair years and is much further to the left than the US Democratic Party. The UK Conservative Party comes closest to being a ‘classical liberal’ party and is firmly centre-right in outlook, much like the corporate wing of the Democratic Party. Very well said, from what I understand myself I fully agree. Good description. This the most accurate piece of work I have ever read about social liberalism. Although I am personally a classical liberal, reading this piece of work thoroughly enhanced my knowledge on the matter. Thank you for the kind words. I took a lot of time to research, think on, and write the articles on the site related to the political identities and how they fit into a political spectrum…. glad you enjoyed it. « What is Classical Liberalism?